Our director, Herb, on the right with a hungry look. 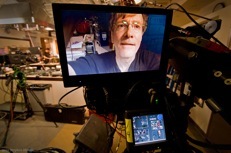 A few shots from the first week of shooting the 2012 season of America’s Test Kitchen. Friday was our outside grilling day and it was a perfect, sunny 70 degrees. The best recipe so far was the Caramel Cake — half a dozen cakes disappeared in minutes. This week is a full schedule of cooking, tasting, and filming — more photos will be posted daily. Peter handles our flying jib, the camera we use for closeups. Talia greens up the set. 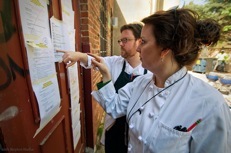 Erin, our test kitchen director, checks the schedule. Melisssa, our producer, and Herb, our director. Dan rushes hot coals off the set. mmmm…. Caramel Cake. Can’t wait to get that recipe! This message is for Chris. My wife (Lisa) and I live in Sacramento, CA. I read in your blog that your daughter is working on a farm about 2 hours from here. Just curious where that is. Santa Cruz or farther north? We use to live in Santa Cruz and love that area! A lot cooler in the summer, that’s for sure. Love your programs/blogs/books/magazine. It’s all good! Can you tell me how to become part of your studio audience and where and when you film your cooking show. Do you offer any tours of the Test Kitchen in Boston? I watch each sunday and dearly love, not just right here, but the whole website….not to mention the magazine. You all are just great and I enjoy each and every one of you. I really enjoy your letters and my subscription of “Cooks Illustrated”. When will I know when to renew my subscription? How can I be in the live audience? After seeing these pics I believe it would be interesting to see a show based on behind the scenes footage. Showing how the program is put together and the behind the scenes folks that are doing it. Thanks for a wonderful program I have enjoyed it for years!! I would like to know how it is decided which receipes will make the show. I think that would be a great idea and show too. Who washes all of the dishes that have been used and then seem to vanish – I want one for my kitchen – whatever – whoever – it is. I hereby volunter to be your official “Taster”. Just love the newsletters and the pictures! Everything I have made from your cooking shows and the cookbooks have turned out just wonderful! My 19-yr old son knows not to bother me on Saturday morning to early afternoon, as I watch all of the cooking shows on PBS. Cook’s Country & ATK are my favorite. I have used the “massive” Cook’s Illustrated Cook Book for the past yr. & love it. Please continue your GREAT work & never leave PBS!! Thanks for a fantastic show. Love every episode. I love the show. However, (isn’t there always a however) I’m allergic to cheese. I’m not sure if it is uniquely “American”, but it is not worth the effort to be sure as it leaves almost immediately at both ends. I’m sure I’m not the only person having such a problem; also, there are those that are lactose intolerant. Since you do so many different cookbooks, why not one for those like me. I look at your Show on PBS all the time. I love how your show comes up with many good ideas and make over on recipes. I do not and still can’t picture myself making french fries in cold peanut oil. I watch the show every (in sunney California) saturday, enjoy it very much, also print out the recipes. Please keep up the good work on the program, as I would miss it veery much, it is my entertanemt, asIm 86 years old. Searching for old friend, Peggy bellas, from Monroe high school. Are u het mother? We want video! And where is Peggy? Hadn’t realized you did an entire season in such a short time. It must be tough to eat all those dishes each day. I commend you!!! Just love the show. You cook with the philosophy I do, only better. Where is the list of what is up for next season? I’m trying to find out what and when I can see on PBS to tease me, and then get it on the web to pick it apart. I am particularly interested in the science, techniques, and tips related to cooking standards and lore; with useful video and commentary. I also take heed in my purchases based on your equipment and taste tests. Your preferences have educated mine. I’m using your show as a slow motion culinary school applied to my tastes and my friends. What’s up next and when is it on? One complaint: could the site designers give me the option to turn the auto replay off? It can become mind numbing, and out of sinc when trying to watch and do at the same time. Hitting pause and play with sticky fingers can get ugly. My husband and I are diehard Cook’s Country and America’s Test Kitchen fans. We have been looking at your shows since it’s inauguration. We love the fact that you explain the science of food. We have tried a lot of your recipes and have yet to be disappointed. We would love to be part of your studio audience. How do we go about doing this? We would really appreciate this.